, D. D. the intimate friend of Dean Swift, is said by Shield, in Cibber’s “Lives of the Poets,” to have been born about 1684, in the county of Cavan, where, according to the same authority, his parents lived in no very elevated state. 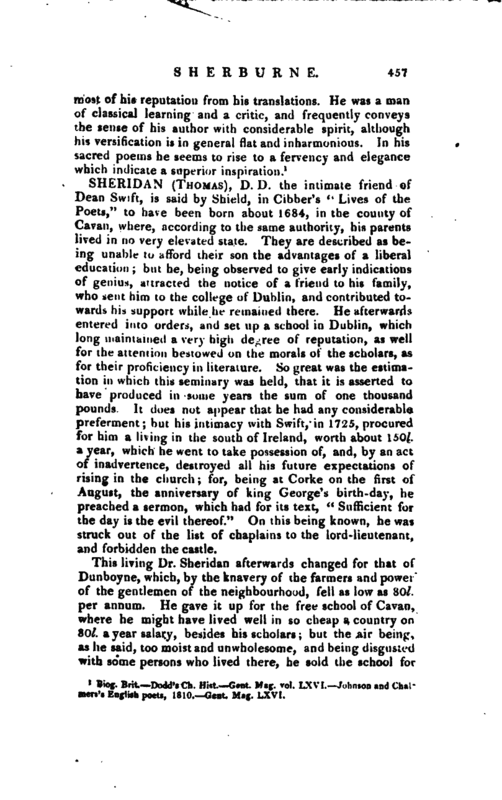 They are described as being unable to afford their son the advantages of a liberal education; but he, being observed to give early indications of genius, attracted the notice of a friend to his family, who sent him to the college of Dublin, and contributed towards his support while he remained there. He afterwards entered into orders, and set up a school in Dublin, which long maintained a very high degree of reputation, as well for the attention bestowed on the morals of the scholars, as for their proficiency in literature. So great was the estimation in which this seminary was held, that it is asserted to have produced in some years the sum of one thousand pounds. It does not appear that he had any considerable preferment; but his intimacy with Swift, in 1725, procured for him a living in the south of Ireland, worth about 150l. a year, which he went to take possession of, and, by an act of inadvertence, destroyed all his future expectations of rising in the church; for, being at Corke on the first of August, the anniversary of king George’s birth-day, he preached a sermon, which had for its text, “Sufficient for the day is the evil thereof.” On this being known, he was struck out of the list of chaplains to the lord-lieutenant, and forbidden the castle. This living Dr. Sheridan afterwards changed for that of Dunboyne, which, by the knavery of the farmers and power of the gentlemen of the neighbourhood, fell as low as 80l. per annum. He gave it up for the free school of Cavan, where he might have lived well in so cheap a country on 80l. a year salary, besides his scholars; but the air being, as he said, too moist and unwholesome, and being disgusted with some persons who lived there, he sold the school for | about 400l. and having soon spent the money, became infirm in health, and died Sept. 10, 1738, in his fifty-fifth year. Lord Corke has given the following character of him “Dr. Sheridan was a schoolmaster, and in many instances perfectly well adapted for that station. He was deeply versed in the Greek and Roman languages, and in their customs and antiquities. He had that kind of good nature which absence of mind, indolence of body, and carelessness of fortune, produced; and although not over-strict in his own conduct, yet he took care of the morality of his scholars, whom he sent to the university remarkably well founded in all kinds of classical learning, and not ill instructed in the social duties of life. He was slovenly, indigent, and cheerful. He knew books much better than men; and he knew the value of money least of all. 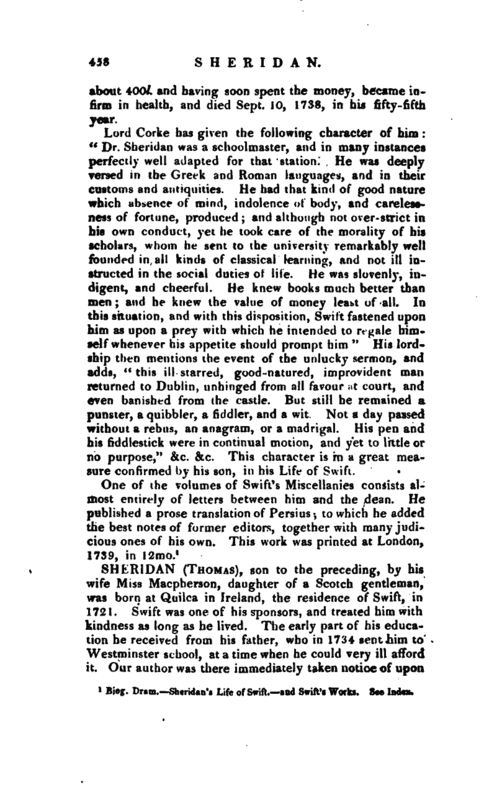 In this situation, and with this disposition, Swift fastened upon him as upon a prey with which he intended to regale himself whenever his appetite should prompt him.” His lordship then mentions the event of the unlucky sermon, and adds, “this ill-starred, good-natured, improvident man returned to Dublin, unhinged from all favour at court, and even banished from the castle. But still he remained a punster, a quibbler, a fiddler, and a wit. Not a day passed without a rebus, an anagram, or a madrigal. His pen and his fiddlestick were in continual motion, and yet to little or no purpose,” &c. &c. This character is in a great measure confirmed by his son, in his Life of Swift. 1 Btog. Dram. Sheridan’s Life of Swift. and Swift’s Works. See Index.